Mungalli Creek Dairy is a family run company that uses state-of-the-art manufacturing equipment and organic, natural farming methods to create a unique range of award winning dairy products. 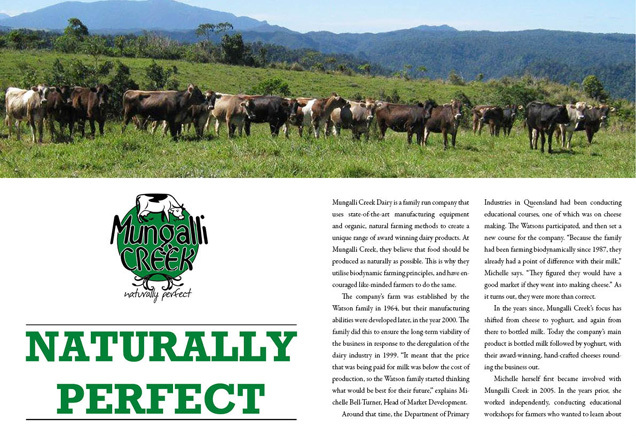 At Mungalli Creek, they believe that food should be produced as naturally as possible. This is why they utilise biodynamic farming principles, and have encouraged like-minded farmers to do the same. The company’s farm was established by the Watson family in 1964, but their manufacturing abilities were developed later, in the year 2000. The family did this to ensure the long-term viability of the business in response to the deregulation of the dairy industry in 1999. “It meant that the price that was being paid for milk was below the cost of production, so the Watson family started thinking what would be best for their future,” explains Michelle Bell-Turner, Head of Market Development. Around that time, the Department of Primary Industries in Queensland had been conducting educational courses, one of which was on cheese making. The Watsons participated, and then set a new course for the company. “Because the family had been farming biodynamically since 1987, they already had a point of difference with their milk,” Michelle says. “They figured they would have a good market if they went into making cheese.” As it turns out, they were more than correct. 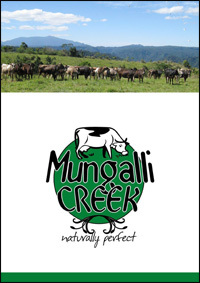 In the years since, Mungalli Creek’s focus has shifted from cheese to yoghurt, and again from there to bottled milk. Today the company’s main product is bottled milk followed by yoghurt, with their award-winning, hand-crafted cheeses rounding the business out. Michelle was attracted to Mungalli Creek for one of the same reasons many of its customers are – their biodynamic farming practices. Biodynamic farming is a method of organic farming that supports a self-sustaining system by emphasising the interrelationships of the soil, plants and animals within. It promotes the use of the natural biodynamic preparations and composts, and demotes the use of artificial chemicals and fertilisers. “We use biodynamic farming principles to work within the laws of nature rather than perpetually struggling against them,” she explains. Those farming practices are not the only thing that attracts customers to Mungalli Creek, however. “We get support not just because we’re an organic or biodynamic farm; we get support because we’re local and because the product has great taste,” Michelle says. “We put a fair bit of effort and emphasis on making sure we get good quality milk for making products.” To this end, Mungalli Creek has a mixture of cattle breeds, including Swiss Brown, Aussie Red, Friesian, and Jersey cows. That mix ensures they have a good protein and fat content in their milk. This means they have the best quality product, from an environmental and taste perspective – as well as a health perspective. When Mungalli Creek first started, consumers were heavily involved in the development of the product. Initially, the company was not in supermarkets like Woolworths or Coles, as they have been for the last ten years. Instead, they had to simply make the product, get up really early in the morning, and go to Rusty’s market to present the product for sale. “So it’s customers who gave us a lot of feedback on what they’d like and what they’d really like,” Michelle says. Mungalli Creek conducted a lot of tests and research through that direct customer interaction, the results of which were vital in shaping their product to the way it is today. Another customer outreach avenue that was established in the early days of the business is the “Out of the Whey Cafe”, the company’s Boutique Cheesery and Teahouse, situated next to the manufacturing area. “We wanted to give people the opportunity to have a connection to the farm, to see how the cows graze, and to see the lovely part of the world where the farm’s actually situated,” says Michelle of the facility. The Mungalli Creek on farm manufacturing plant and Cafe – is located on the rolling green hills of the southern Atherton Tablelands in tropical North Queensland, and looks out to Mount Bartle Frere, Queensland’s highest mountain. It is also located just above Mungalli Falls, and surrounded on three sides by World Heritage rainforest. “It’s quite a beautiful area,” Michelle says. The “Out of the Whey” Cafe was established in 2002, a couple years after Mungalli Creek began their processing operations. The building itself is the Watson family’s old homestead, and visitors can come to learn about how the product is made – and then taste that product for free. “We have all the different yoghurts and soft cheeses, and occasionally when we have excess milk we’ll make some farmhouse cheddar so they can taste that as well,” Michelle says. That location is also home to some of the world’s best cheese cakes, she says, both the chilled and baked variety. The Cafe is not only a great way of interacting with the customers; it also works to promote new business. According to Michelle, it is not unusual for the facility to get a visitor from Sydney or Melbourne who will then go home and then tell their local organic shop about their product. “They have a great effect in actually getting the product further spread,” she says. In general, Mungalli Creek’s commitment to customer outreach continues to remain strong. They still have a presence in Rusty’s Market, and on their packaging they have a number that customers will quite often call to give feedback. In the near future, Michelle says they want to expand that interaction by adapting to social media, with an aim to maintain contact with their customer base and continue the feedback loop. Mungalli Creek has roughly 40 employees, with 20 to 25 working full-time depending on the season – and their employee-company relationship is as strong as it can be. They are still a family business, and employ about 10 per cent of the local population between their farming, manufacturing, cafe and distribution operations. Additionally, they are even attracting workers from further afield, people who are happy to drive an hour to work and back. In general, Mungalli Creek has a community focus. In addition to providing work on their family farm, they have also provided opportunities to other farmers in the local area to become biodynamic, an offer two other local farms have taken them up on. “They are all part of the success of Mungalli Creek Dairy,” Michelle says. Also, as demand for their product has grown, they have developed an additional Jersey Milk brand, which supports three more farming families.